19th Century mountain cabin which sets right on the Famous Pecos River in the Sangre de Cristo Mountains in Tererro, NM. The Cabin has been studied, dated, and is one of the last original homesteads in the area. This is a true historic site maintained by descendants of original family for five generations . The cabin has a kitchen, and dining area with seating for 4. There is one bathroom and one bedroom with a comfy queen bed along with a cozy sitting area. This is an outdoors enthusiasts dream come true. Start by waking up early and having your coffee on the river patio right at your front door, enjoying the view of humming birds and mule deer moving through the river banks. Enjoy some of he best fly fishing in the world for Rainbow and German Brown trout without ever needing to go more than just a few feet on your own private section of the river. Later before lunch comb the area for turquoise and silver. The small now ghost town of Terrero was made famous as a busting mining town in the days of the old west. The original mine sets less than a half mile from the cabin across Hwy 63 from the entrance to property. After cooking some your those fresh cold water trout for lunch take a hike up the canyon in the middle of the Sante Fe National Forrest to see elk, eagle, deer, and other wildlife. If the quiet seclusion is too much don’t worry, the town of Pecos is only about a 20 minute ride through the beautiful river canyon. The old general store is still in operation and conveniently located about two miles down the river from the cabin. Here you can enjoy other amenities like horse back riding, guided pack tours, and for the sportsman out there guided elk, deer, and bear hunts. Be sure the check out the Tererro General Store's Facebook page for activities and other amenities. For a more vibrant experience head to the historic town of Sante Fe which is about a 40 minute ride south where you will experience excellent southwest cuisine inspired by native chilies harvested from the area as well as native southwestern art, and heritage. The town also receives its fair share of entertainers from local bars to large scale concerts. Be sure to hit Jacolopes on Cerillos for great souvenirs and the Native Market at 'Old Towne' for authentic southwest jewelry, and art. After a day in town come back to a quiet evening, start a fire in the pit and enjoy the clearest sky you will ever see. The stars are countless and the evening air is cool, just like the perfect fall night, but in summer. At last you will be rocked to sleep by the sound of the rushing river outside. A true paradise awaits you. For interesting reading on the area be sure to look up 'Pioneers of the Upper Most Pecos', and Beatty's Cabin. Sondra Bennett is the fourth generation heir to the Rivera Ranch. Her children assist her with managing the Ranch just as she did for her mother Ramona Rivera Lawson. Ramona was born in the larger cabin and raised there by her mother Ignacita and father Encarnacion Rivera. During that time the ranch was a full-time outfit moving mostly beef, horses, other small livestock. The River Cabin is the last structure built on the 6 acre lot and was originally used for hanging tack and dry storage. The first buildings built were the dugout next to the creek followed by the barn (no longer standing) and finally the larger cabin. The cabins date back to the 1840's and were carved out of the Pecos Wilderness by Cristino Rivera (Sondra's Great Grandfather) with mostly hand tools, ox, and later a saw mill. Cristino settled the area and is accredited for establishing the town. Sondra has been a part of the Ranch her entire life and has fought to keep it in the family as her mother did before her. Sondra honors the memory of her mother by continuing the legacy and ensuring her grandchildren (6th generation) will enjoy and respect it just as she, as well as those before her. Sondra resides in Cleveland, TN and travels to Tererro as much as possible. She loves sharing the beauty, and peacefulness of the ranch with those who are looking to escape the hustle and bustle of everyday life. This little cabin was a nice retreat for my husband and I. It is very rustic and nicely secluded. We were able to fish off the front porch and caught several brookies! Sondra was helpful. I was glad I took my own skillet, knives and plastic ware as the selection at the cabin was very minimal. There is no oven and the refrigerator is a small dorm sized one. We made do and were able to keep several things in the cooler during the week because it was so cold outside. For a quiet week away for just the two of us, this place was great for the price! I know my husband would go back for sure! The property was beautiful and everything I needed to unwind with my wife. We stayed at this cabin for a few days and had a great time! The river is right in front of the front porch! We fell asleep listening to the running river. We fished the river and the small creek behind the cabin. 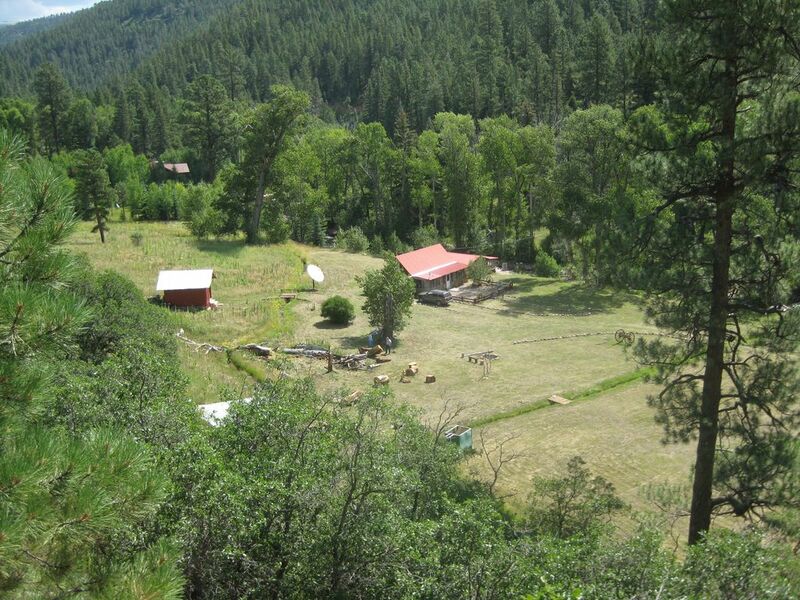 The property is beautiful and very close to nearby fishing areas and hiking trails. We look forward to coming back soon! A cozy cabin nestled right next to a soothing stream. My wife and I really enjoyed our weekend by the river. Just fishing, relaxing, and watching the millions of stars at night. It’s in a great location to easily reach several hiking trails too. We will be back!